So what else did LG show off in its mobile section besides the Optimus F series and L II? 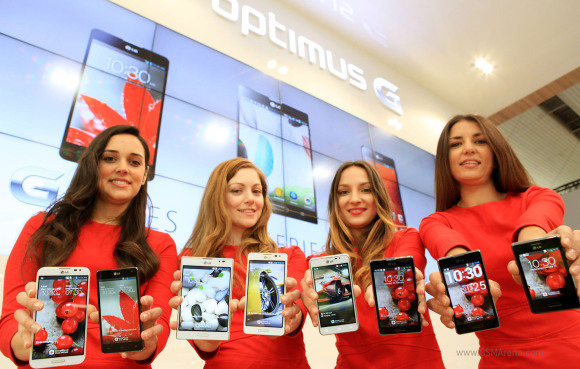 Its top-of-the-line Optimus G series of course, along with Optimus Vu and several more devices for the F series and LII line. First up, the LG Optimus G Pro, LG’s flagship Super phone that features world-class hardware. Announced before MWC 2013, the Optimus G Pro comes with a 5.5” IPS 1080p display and is powered by Qualcomm Snapdragon 600 processor with a 1.5GHz quad-core Krait 300 and Adreno 320 GPU. Other specs include 2GB of RAM, 13MP rear camera, 2.1MP front facing camera, and 3,140mAh battery on board. It runs on Android 4.1 Jelly Bean with LG’s very own Optimus UI on board. We mentioned the Optimus L7 II, and L5 II before but at the show, LG is also showing off additional devices – the L7 II dual and L3 II. Optimus L7 II dual features practically everything you get with the L7 II except that it supports two SIM cards on one device. Finally, if low-end devices are your cup of tea, the Optimus L3 II is a 3.2” device that packs a 1GHz single-core MediaTek processor on board with 3MP camera and a microSD card slot for I assume, its very small internal storage. Running on Android 4.1 Jelly Bean, perhaps the only thing to look forward to on the L3 II, the device features all the usual stuffs you find on a smartphone such as Wi-Fi connectivity, GPS, Bluetooth and such; there also is a dual-SIM version called the L3 II dual. LG does not have anything new for its Vu series though, the 5” phablet that boasts a 4:3 ratio as opposed to the typical 16:9, but LG does have them in their booth at MWC 2013, so there you have it, LG’s take at the smartphone market that brings a device to practically every segment in the market.